I have been getting many requests for me to share with you the techniques and steps I use to sculpt my faces. Right now I am fascinated with old man faces. 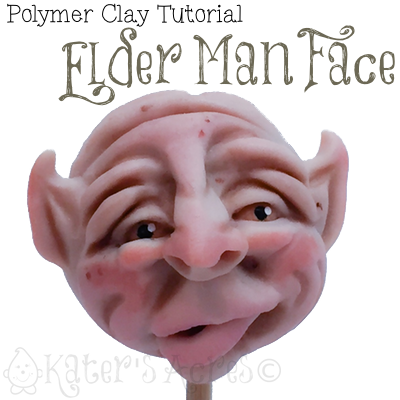 This walk through will show you how to sculpt an old man face in polymer clay. For many of you who have been around the polymer clay world for awhile, you will likely see the influence of both Dawn Schiller and Maureen Carlson in my faces. I have mentioned and reviewed both of their books here on the site: “Faemaker: Making Fantasy Characters in Polymer Clay” by Dawn Schiller [read the Top 5 Polymer Clay Books Post here] and “Fairies Gnomes and Trolls” by Maureen Carlson was our book of the month for April. Please Note: these are my own steps and techniques that I use every time I make a face. Learning how to sculpt an old man face takes time and patience, but can be done pretty easily. Many artists start their faces and have a different “step” process. There is no right or wrong way to sculpt a face; the right way is whatever works for you. You can use any amount of clay that you would like depending on how big you want the face to be.. If you need a great skin color recipe, try my favorite, Luminescent Skin. Full instructions are provided in the Old Man Face Worksheet. When you are done baking your face, it’s time to add the paint details. It’s the finishing details that really change the piece and add to its’ personality.